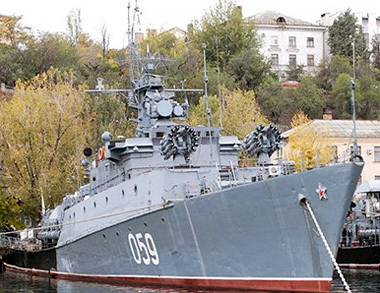 Carve-up of Black Sea Fleet and tug-of-war between Russia and Ukraine lasted since autumn 1991 till May 1997. At first, Kiev wanted to hit the jackpot by decrees; then the concept had changed. Complements of ships and BSF units deployed at Ukrainian territory were simply forced to swear fealty Ukraine by all available means – sticks and carrots, promises and menaces. It was implied that a ship considered Ukrainian if at least a part of crew had sworn fealty Ukraine. It came even to rebellions and straight pirate-style hijacking. For instance, on March 13, 1992 a part of the crew of B-871 submarine (would-be Alrosa) having sworn fealty Ukraine seized the sub; later on, the rest of crew repelled the grabbers. Luckily, that happened at moorage wall – what if deep in the sea or during combat deployment?! In July 1992 another scandal raised around frigate SKR-112 which commander having hoisted Ukrainian flag hijacked the ship from Donuzlav Gulf to Odessa. It almost came to a real naval battle – under BSF Commander's order the runaway was pursued by naval aviation and warships. At the last moment admirals reasonably decided not to use arms against deserter ship, although that step was authorized. Further fate of the runaway which became Ukraine's first ship is unenviable. As there was no money for its overhaul, the ship had been moored till the end of 1997. Then the rusty junk heap was written-off and scrapped in Inkerman in 1998. By the way, some "responsible" persons even suggested apportioning of the fleet-of-discord among all former USSR republics. Though, for some reason neither Kirghizia with Uzbekistan nor even Tajikistan expressed fierce desire to possess submarines, preferring to take conventional arms. At last, Kiev realized the cake was too big and offered to halve the fleet in brother-like manner. Later on, the two countries agreed in more reasonable proportion – Ukraine got 18.3% of BSF, Russia obtained 81.7%. Finally, disputants struck hands in a fact that Russia was recognized as owner of 388 ships (out of 833 itemized in BSF roll as of May 1997), 161 aircrafts and helicopters. Manpower of Russian BSF in Crimea was determined as 25,000. Russia temporarily uses three ship basing sites, two main and two alternate airdromes, one disposition area of coastal troops (marine). There seemed to be a point to sponge off sweat and breathe a sigh of relief. But while Moscow boyars and Kiev hetmans were parceling the scrap, it simply got rusty at moorage wall – devolution of BSF took almost whirlwind form. Suffice it to say that current manpower of Black Sea Fleet barely reaches 15,000; and since the breakup of USSR the fleet has not obtained even one more or less new ship; moreover, no ships at all! Should we consider Bora, a guided missile air-cushion ship had been under construction for ages – 13 years, since Soviet era? As well as obsolete minesweepers of 30-year old projects Valentin Pikul and Vice Admiral Zakharyin (also had been built for 12 years). The piquant point is that both ships were initially designed for anything but our fleet. Pikul was constructed for Indian Navy; Zakharyin was supposed to be exported to Vietnam. But then both countries refused acceptance of antique minesweepers. Though they were well enough to us. Things useless for even Vietnam were quite satisfactory to Russian Navy! Through postwar period Black Sea Fleet has not received even one new aircraft. What new ships and airplanes are we talking about as Moscow has not appropriated funds even for simple maintenance of the fleet at moorage wall? Only one cruiser out of four remained at the fleet. Built in 1952, cruiser Mikhail Kutuzov was written-off and planned to be scrapped, although then towed to Novorossiysk and turned into museum. Constructed in 1965, cruiser Moskva was decommissioned, then written-off and sent to India for utilization in 1997. Cruiser Admiral Golovko (launched in 1962) was written-off in 2002. Only "brand-new" Slava left (laid down in 1976) and was renamed into Moskva. In fact, this cruiser had not taken the sea since 1990, being either repaired or modernized. Only in April 2000 cruiser Moskva sailed off moorage wall for the first time since USSR collapsed. When you pass by this missile cruiser on a touring launch, guide will definitely tell you about the ship's power in enthusiastic manner – the cruiser allegedly holds all Turkish Navy in fear as it is capable to "reach Istanbul" even from the moorage wall. However, this Project 1164 Atlant guided missile cruiser was launched 30 years ago and may hardly be considered up-to-date. Its equipment and electronics are domestically-made, i.e. obsolete and aged as native instrument-making industry is rather dead then alive. So, what shipborne equipment it can produce? That based on Soviet engineering achievements of mid 80-ies?! The cruiser has powerful arms though. The ship was previously armed with 16 Bazalt antiship launchers designed for P-500 cruise missiles. In due time the system was considered unique and CMs called "flattop killers". An eight-missile "wolf pack" (lead missile at altitude of 5 km, the rest – at 40-50 meters) autonomously flies toward a target; lead missile searches out targets, transmit data to flown missiles, defines the biggest target, aims nuclear-charged CM on it and distributes the rest of targets. But, unfortunately, the whiz system Bazalt was commissioned as early as 1975; that's the level of electronic engineering actual for early 70-ies. Since that time Western shipborne air defense made great progress – most likely, these missiles will be detected and either destroyed long before they approach the target or decoyed by jamming system. That is why Moskva was upgraded and Bazalt was replaced with P-1000 Vulkan antiship missile system. But this system was also designed in 1979, so one may name it newest only carrying a heavy load of "admiral tea". Suffice it to say that opponents' countermeasure systems haven't been standing still during recent decades while our military industry has been simply eating away inherited Soviet developments and has not created anything new. But the main thing is that the ship's 25-year lifetime has been expired and, basically, it no longer may be modernized as a platform for up-to-date arms and equipment. 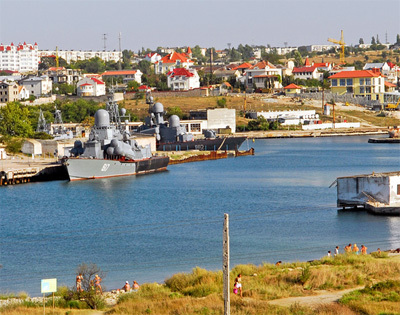 Currently, only three large ASW ships – Kerch, Ochakov and Smetlivy – have "survived" out of 11 Soviet ones; the rest were scrapped in 1992-2002. Among survivors, only 42-year old Smetlivy is barely mission-capable. 38-year old Ochakov is nearly written-off and has been languishing under repair for 19 years. As my naval friends said, 35-year old Kerch is practically combat-ineffective and will be also written-off in a while. Half of 12 frigates was utilized, the rest were apportioned. The sub issue is obvious, too; formally, only one is in-commission, really – none. 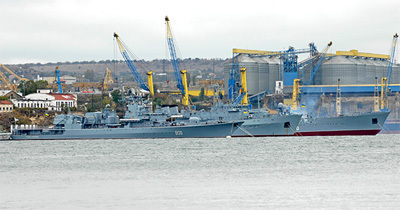 Eight missile ships were written-off, seven were handed over Ukraine. Present BSF has only seven small ASW ships out of 24; seven landing ships "survived" out of somewhat 50; only 10 minesweepers remained... Last year, when I discussed problems of Black Sea Fleet with Rear Admiral Oleg Lazarev (ex chief of RN Combat Training Department) he casually said: "Fleet… Virtually, that's a flotilla". All sailors admit not above 30% of warships are mission-capable. The youngest one is 17 years old; the oldest one is 45, at the average – 30. Note that lifetime of any warship must not exceed 25 years due to hull runout. Of course, a ship may serve much longer when properly maintained, although shipwrights give no guarantees as for this; whatever may happen to ship, fatigue of metal remains valid so far. Besides, it's virtually impossible to upgrade an old ship for present-day battle conditions.